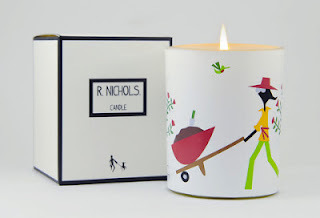 Several years ago I discovered the amazing artwork of R. Nichols via his pretty, chic stationary line. Almost every year I order something new - for the holidays, thank you cards, invites - you name it! His designs are so fresh and fun and speak to everyone no matter where you are from or how old you are. 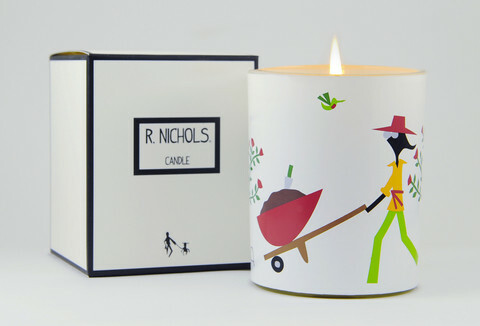 Now I'm very excited by his recent line extension into fragranced candles. 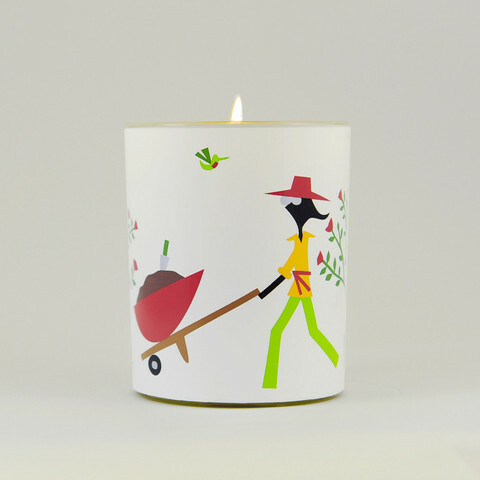 I loved the art that comes with the Bloom Pure Scented Candle. This chic gardener with her adorable blooms and outfit are perfect for Spring and Summer. As soon as I opened the outer packaging was I was delighted with the amazing scent of pure rose with touches of other white flower notes. It's housed in a sturdy glass jar wrapped with the artwork decal which is fired-on the glass, and glows so beautifully behind it. When the candle burned, the scent gently fragranced the air without becoming to cloying or strong, which I loved. height: 4" diameter: 3 1/8"
*This product was provided courtesy of R. Nichols PR for reviewing purposes.